so great was your shame at giving him no son. his eyes seeking only his God. It was you who sent him to my bed. I suffered vaguely his withered touch. my dark skin, my long smooth limbs? I did exactly as you wished. I conceived his child. I carried the baby you could not bear. that I would not love him? the birth of Isaac was a miracle to you. My son was magnificent and strong. I think his father loved him for a while. Then Isaac came. Of course Ishmael teased. Your house grew small with two sons. Your face spoke hatred for me and my child. 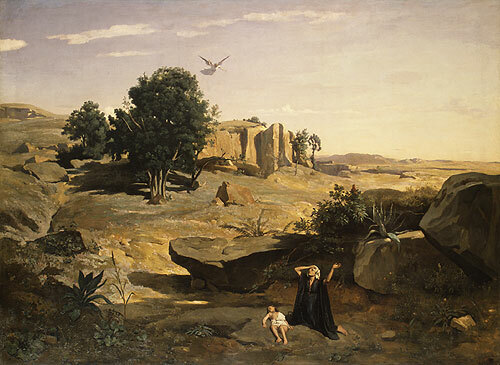 Abraham turned away, showing Isaac his favor. Ishmael claimed the power of those who are spurned. into the desert to die. I placed him in a patch of shade and walked away weeping. so that Ishmael would live. in anger and in strength. Did you wonder or know we had survived? Did you once regret your heart's angry mandate? before some kind spirit stayed his hand. and do not love you now. I weep for us both. that our sons grow with no love for each other? we did not see the danger, that while we broke each other's hearts Abraham would have murdered both our sons.